Product, UX, and Customer Success teams. Pros: If you are building a SaaS, user onboarding is paramount and if your app does not have an onboarding sequence it doesn't look professional at all. What's worse, if you do a mediocre job at coding your sequence or use other tools out there that are not that great, it will leave a sore taste with your users. Userpilot is clean, elegant, beautiful, flexible, and very customizable. I am also using the white-labeled version which makes it look as if it is part of our app and not a 3rd party tool. Very happy with it. Cons: That I have to wait for some of the features on their road map like the NPS (Net Promoter Score). Overall: We did not have an onboarding sequence in our App and customers were bombarding us with support calls for setup and silly things (mostly because they were too lazy to click around). Also, our software requires following a certain sequence of user actions (1, 2, 3, ...). Userpilot fit seamlessly and solved all these issues. Pros: The ease of use and flow of creating a great onboarding experience in a very short time. We have been losing customers at a crazy late within the past 3 months, let alone all those angry support tickets we get where they are usually for silly questions. I guess it's a problem with our software. Still in the meantime, while we are updating our UX/UI, Userpilot has helped us reduce the amount of churn by at least 30%. We were also able to get the average amount of support tickets from 20 a day to less than 5. Cons: I would have appreciated more templates out of the box. Also you have a thin line between too much customization and too little. Userpilot has all the customizations one can dream of but still as normal user, you might not need them all. Overall: I am very satisfied. Their support is awesome and responsive as well. Pros: Userpilot is great, the software helps our customers better understand our platform and the possibilities it brings. But the software is not even the best thing here, it's the incredible personal service. They are DEDICATED to make everything work, perfectly tailored to your needs. Cons: At the moment it's not a click-and-go solution, which is fine since they're helping you personally to make everything work. Overall: We started-off with Userpilot when they where still in BETA. They have come a loonngg way. At this exact moment Userpilot helps us with a massive roll-out, onboarding over 2000 users in 1 month. If you're looking to create a wonderful experience for your clients, then Userpilot is your go-to tool! -Helps Increase Long-Term Customer Retention as I am able to easily point out features in my software which may not be obvious. Overall: Less time, stress and money spent on the phone and email support. It paid for itself upon activation as I knew the value was going to change everything, quickly....and it did! Pros: Super easy to use and the templates make your product walk-throughs look great. Cons: Nothing was unexpected, service was great.. product works great. Overall: User on-boarding and product adoption. Pros: UserPilot makes it easy to create professional looking tips, flows and wizard-like instructions to help users navigate your software. Extremely customizable and default settings already look pretty good. Cons: Because it is highly featured, there are lots of options - and perhaps not yet enough help files to explain each of them. Overall: I have looked at many different options in this space and while UserPilot perhaps has a little maturing to do, it is by far the best option on the market. Well done guys. 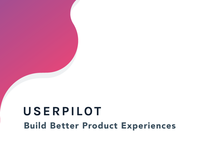 Userpilot is an awesome tool that helps onboard your users and increases adoption. Pros: Its easy to use and I personally really like the UI. Cons: I am missing a self service for the free trial. Pros: I have been using userpilot even before the latest update which made it much more intuitive and user friendly. The main advantage is that when you create a navigation it will be working even when you update your app / UI. I had tested quite many other similar solutions and most of them even with a small UI change you had to update the tour. Cons: When publishing a tour, minor issues might arise but the support is fixing them quite quickly. Pros: The software is very carefully designed and the UX is easy to use. Installation was also quite simple. User onboarding is extremely important to us as it affects our conversion rates directly. So we are happy with how this product has helped our business grow. Cons: Their terminology is new and needed to ping their support before I understood what a few of their labels mean. But always got fast replies. Pros: If you have a product for sale or a website that will be used it is a really good idea to have a thorough onboarding walkthrough. Userpilot is one of the best for this. It is a great way to show users, customers, clients how to use your site/product. Cons: Can be spendy if you have a lot of users/visitors. Very comprehensive also means a bit of a learning curve, I'd like to see many more training materials/videos. Pros: The application is really user friendly and has a low learning curve. 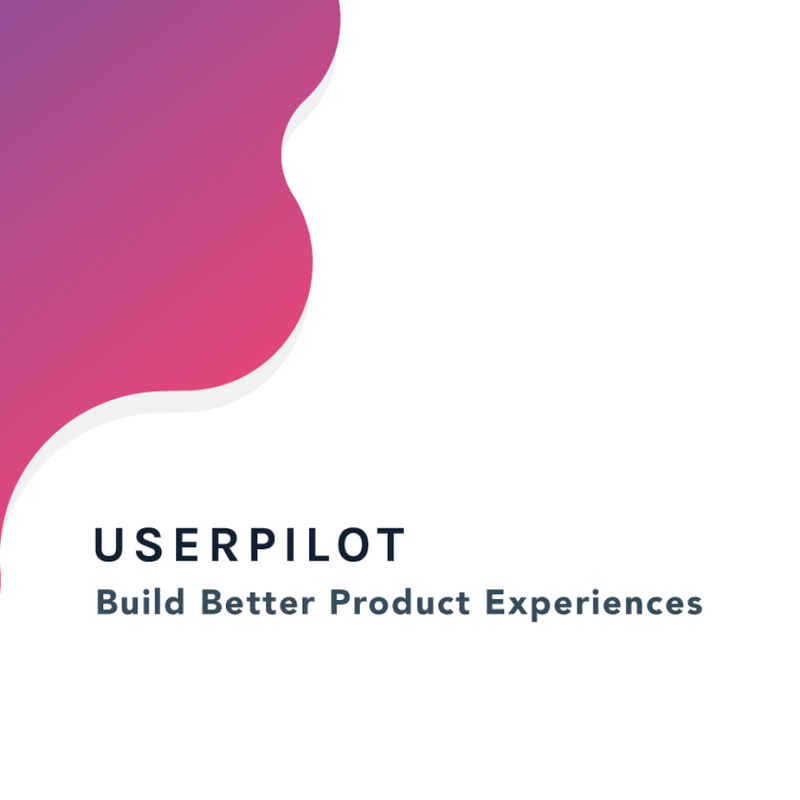 I use User Pilot for our new user onboarding but you could it for plenty of other use-cases to drive user adoption and engagement with your product. It took me less than an hour to create my first experience and deploy it on our production site. The support at User Pilot is top notch and truly exceptional! They're always available to answer my questions and would readily jump on a meeting with me to troubleshoot any problems. Cons: There were a few bugs as expected with any new offering, but nothing that their support team couldn't handle and take care of. Overall: Extremely pleased with User Pilot and look forward to extending my use-cases for User Pilot! Pros: UserPilot lets you get started building onboarding tours the moment you buy, without contacting your developers. The chrome extension lets your content creators design onboarding right on top of your site or web app, and then your developers can integrate it within minutes when it's done. Gives you total control and freedom to update it whenever you want, way easier and better than you could hard-coding it. I use it on three projects. Cons: I do wish it had an offline mode and native app support. Overall: My developers stopped wasting their time building a crappy, static onboarding experience and got back to building our product, while I got to experiment and play with building an awesome, optimized, always current onboarding experience. Pros: Easy to set up and use which means you can easily create walk through guides for your users. It also allows for several options which is a plus. Cons: For me personally I wish the app area was a little friendly. The overall UI is ok but not great. Overall: Overall my experience has been good and the software is solid. I have no regrets. 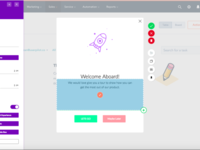 Pros: Userpilot helps you leads when onboarding on your product, with the help of easy setup and user friendly user interface. I like the auto trigger features that guide your leads unlock the process of your product. It's easy to use no coding skills needed. Love the Push hints & tips features. User experience is great, design the group and tooltips is easy. You can create your own theme for your product. Great experience dashboard, simple yet user friendly. Cons: Got no problem with user interaction. Just great. 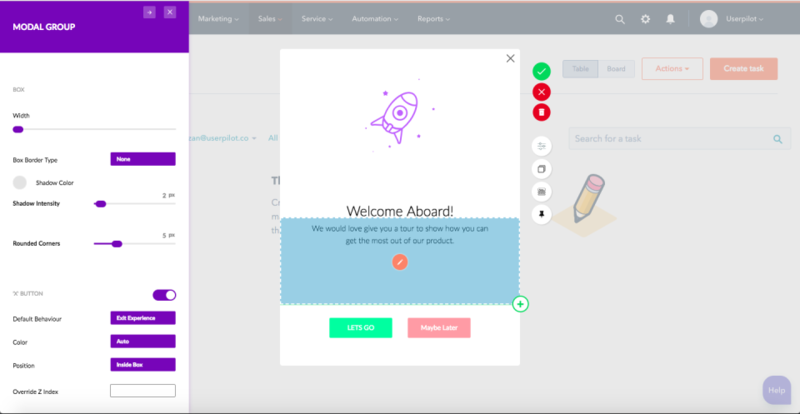 Overall: Userpilot helps your leads access and learn your product easily and faster. Userpilot is easy to learn, the price is reasonable. - Great and fast support team which is one of my definitive lines for having a great product experience! Cons: It's hard to come up with a con for userpilot and I wouldn't consider this a negative "con" but Userpilot is incredibly powerful so to the novice, it can be quite tedious even with the aid of their prebuilt playbooks and UI elements. Pros: Userpilot fits in your brand design perfectly. You can adjust any aspect of the widgets: Fonts, Colors, Corners and shadows just by pointing and clicking. It offers different types of pop-ups to guide the users effectively over multiple pages. It is possible to enrich the segmentation data of Userpilot via script to show the users your guides just at the right time. Cons: It isn't possible to connect Userpilot with any CRM system through pointing and clicking. The pulling of the data has to be programmed via script. Overall: Onboarding clients on our client portal and on our membership sites effectively. Pros: - Extremely easy to use. I've tested multiple user on-boarding softwares and I think Userpilot is one of the most easiest to use software available in the market. - Very fast. Userpilot's JS doesn't cause delay in the loading. This is very important for any software experience. - Great support. These guys are extremely helpful. I actually had a live video sharing session with one of the support person, and he fixed my problem in 5 mins. Cons: - Some minor bugs related with the dashboard UI which I assume will be fixed soon. However, nothing serious that impacted my work. Pros: Userpilot comes with nice design and various features which I really appreciated. Cons: Not really easy to use at the beginning. I had to do a lot of tests and reading. Overall: Userpilot allowed me to offer a nice onboarding to my users. Pros: UserPilot is amazing and the founder behind the software is rock solid. I have been using this at FunnelBake and absolutely it. Cons: Still need some better UI/UX designs and templates. Pros: Easy to setup and reduce direct questions from users. Cons: So far so good, I haven't find out any problem now. Pros: UserPilot has enabled non-developer folks in our products team to create great onboarding workflows for new users. To do this kind of work typically involved getting the help of developers and turnaround times were slow because if you wanted to iterate, you would still be reliant on a developer to help make changes on the code. The tool also allows segmentation of users which allows displaying walkthroughs based on certain specified criteria. Cons: The styling of the modals may not gel with your product's design aesthetics, as the tool is still in its nascent stages and still needs more flexibility and variety with its design patterns. Overall: UserPilot has made it easy for non-technical folks in my team to create user workflows that guide new users as well drive product retention. Great tool for a great price! Pros: Our experience with UserPilot thus far has been a good one. New updates are always being delivered and the user interface is easy to use. Cons: The only con at this point is that the software is still young, which means they don't have everything that competitors have. That said, as I mentioned, they are constantly adding new features and functionality. Would be an amazing tool if it wasn't so buggy. Pros: At first, UserPilot seemed great. It was easy to use, the UI was fairly simple, I was creating guides in a few minutes. It covers all the basic needs for a simple app or webpage walkthrough and allows you to spin up great looking guides fast. Cons: It was just loaded with bugs. The app kept breaking, deleting things I had done, encountering errors, freezing etc. It eventually became completely un-useable as I couldn't get a guide finished without running into some kind of an issue. Overall: UserPilot would have been perfect for my needs had it been more stable. Unfortunately, I just couldn't handle all the bugs. Pros: I love the way I can add helpful info quickly and easily for my clients. Cons: I wish it was more integrated with Wordpress. Overall: So far I love it. Pros: Lots of features and functionality with an innovative way to create walkthroughs using a Chrome Extension. Cons: Lots of bugs, but this is to be expected with software that is very new. The guys have been responsive with fixing them. Overall: I've setup once and users' can imediatly see the userpilot guides. Pros: Really easy to get started and to create onboarding experiences. Cons: It's powerful, so digging into it can take some time. Overall: Great for onboarding customers in your web application.